So What Exactly Are Eyelash Extensions? Classic Extensions (1:1) are single strands of fiber which look just like real human lashes... but better. Each extension is bonded to a single natural lash using a tiny drop of medical-grade glue. The adhesion is seamless, resulting in a very realistic appearance. Extensions range widely in length, width, curl, even color, allowing for an infinite variety of style. Volume Extensions (3D+) utilize an advanced application technique where multiple extensions are applied to a single host lash. In this procedure, only very fine strands are used to compensate for the added weight. The bond is considered semi-permanent which means each extension will remain in place until the host lash naturally falls out. Extensions do not interfere with the natural growth cycle of lashes and hence do not damage the lash line. Properly installed extensions and glue never touch the skin. In the initial phase a technician will examine the health of your natural lashes and determine a safe length and weight limit of the extensions. She will discuss your desired look and select a combination suitable to your unique facial features. Your lashes will be thoroughly cleansed and primed. Anti-aging eye pads will be placed under your eyes to enhance your experience. Bottom lashes will be protected with medical tape. The application of eyelash extensions is a relaxing, pain-free procedure. You will be lying down comfortably with your eyes closed for up to two hours. Most clients use this time to take a nap. Extensions will be checked for proper adhesion and fanned with a fine mist to speed up the curing process. Finally, a coating sealant will be applied to maximize the life of the bond. Although bad reactions to adhesive are extremely rare, we recommend that all new clients come in the day before an appointment for a simple Patch Test. It only takes a minute. A tiny dab of glue on your forearm can rule out any potential problems. To minimize prepping time and maximize lashing time, please do not wear eye makeup to your appointment. Also, please do not curl your lashes 48 hours before. The technician will prompt you to remove your contact lenses before the procedure. Please have your lens case on hand to store them. This curing period is the most crucial stage in ensuring a lasting bond of your extensions. Do not get them wet or expose them to steam (as in a hot shower or a sauna) during the first 24 hours. Oil and salt weaken the bond of extensions. Use only oil-free cleansers, makeup and makeup remover. Gently rinse your lashes with tap water after a swim, workout or if your eyes tear. After 24 hours you can and should wash your lashes daily. Oils from your skin build up on your lashes weakening the bond. Even more importantly, you must keep the eye area clear of bacteria to prevent irritation or infection. Use lint-free towelettes or a makeup brush to avoid fibers getting stuck at the lash base. Rinse lashes with a mild oil-free cleanser and water. Extensions may sometimes get tangled or twisted. Simply brush through your lashes every morning to keep them in shape. Extensions left tangled may start to pull on neighboring lashes causing discomfort. Avoid tugging or pulling on your lashes. Do not try to curl them and do not let the pillow crush them while you sleep. Do not rub your eyes. A rough handling of your extensions may cause them to break off. You should NEVER ATTEMPT to remove lashes yourself. There are many types of extensions available - enough to make one's head spin. Creative marketing terms and misleading labels further confuse the consumer. What is the difference? Original eyelash extensions were made of acrylic resin. Comparatively thick, rigid and glossy, they can appear somewhat fake. After exposure to moisture, acrylic lashes take on a dull, chalky appearance. They're also notorious for 'getting bent out of shape'. Despite their economic cost, many salons no longer offer synthetics, giving way to improved materials. With emphasis on REAL... mink lashes are made of genuine mink fur, collected from the tail of the animal. Reputable suppliers will swear by their cruelty-free practices whereby the fur is gathered by grooming. Authentic mink lashes are superior in softness and offer the most natural appearance. The two major downsides are the exuberant cost and lack of natural curl which requires the lashes to be permed or curled daily. Mink and silk lashes are by far the most popular choice at salons today. Contrary to what the name implies though, most mink lashes are not made of mink and most silk lashes are not made of silk. 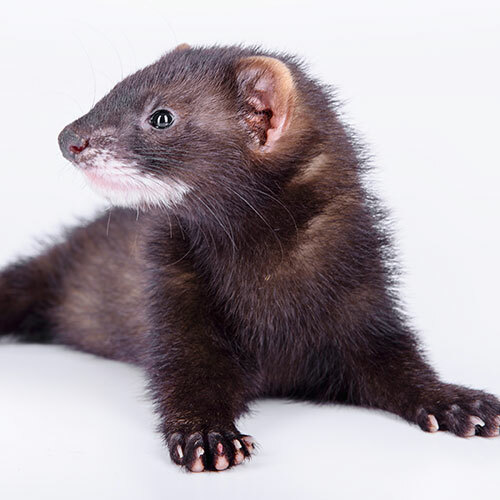 You may see them labeled as faux mink or synthetic silk as they are both made of man-made polymer fibers. Main advantages? Deeper hues, consistency in shape and size plus a permanent curl. There is little if any perceivable difference between mink and silk lashes. Both are designed to closely mimic delicate fur lashes with a full-width base and a finely tapered tip. The thinner the tip, the lighter the lash. They vary in finish from matte to semi-gloss. However, these features depend greatly on the brand of lashes. The Lumilash extensions of choice – ultra-light lashes are the next generation in lash engineering. Similar to mink and silk lashes, they are made from advanced poly-fiber material (PBT). They have a rich black hue and strong curl retention. What makes them superior is their cleverly designed shape. Instead of the classic round cross-section, ultra-light lashes are oval or flattened throughout. This shaves off much of the unnecessary weight making them safer and more comfortable to wear. Additionally, a moulded groove provides a wider bonding surface, hugging the natural lash from side to side for ultimate hold. A fresh set of lashes will look perfect this whole week. You may loose an occasional eyelash here and there. This is perfectly normal and will not be noticeable. As more lashes mature and fall out, your extensions will start to look less full. Now is a good time to book your refill appointment to continue the life of your lash set. By this time, gaps are inevitable. A refill is necessary to revive your set. If you decide not to continue wearing extensions, you can blend the look with mascara until the remaining lashes fall out or opt for a lash removal. By now, most of the original lashes will have fallen out. If you haven't had a refill, a complete new set of lashes will be required to restore the look. Lumilash is dedicated to ensuring the highest standards of safety and quality to our clients. Our technicians are well trained and licensed. We use only medical-grade adhesives which are fully compliant with North American and European Union regulations. Our glues contain no latex or formaldehyde. Sign up with your email to receive news and monthly deals. Our email frequency is limited to once a month.